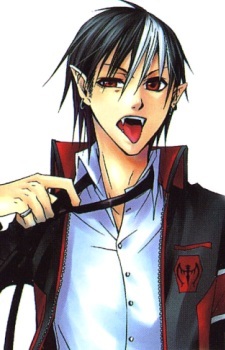 Aldred, is the adopted son of the headmaster of the vampire school which is Kain van Envurio.And is said to be the most unlikely vampire at the Mercenary Specialized School and a failure, as he is the only vampire there to not have a Lineage Weapon, which all vampires are born with. Nonetheless his friends among his team, which he leads, have seen his dedication and genius, so respect him. Aldred is the vampire protagonist, who was born without a Lineage Weapon. He has spiky black hair with white bangs at the front. He is very powerful physically, but still cannot compare against Lineage Weapons, which he is quite bothered by initially, thought he tries not to show that. He is greatly respected by his fellow team mates, as they recognise that he is not a failure. He meets Kei, who is assigned to his team by his father, and drinks his blood in order to draw out the Holy Lance, so they can fight the blood-drinking Vampires.